RUC officers with radar traps (for catching speeding motorists) in November 1980. A UUP MLA has welcomed a move by the government to allay fears that police personnel in Northern Ireland could be excluded from serving on the proposed unit designed to probe Troubles-related killings. Doug Beattie told the News Letter on Wednesday that plans are under consideration which would mean the Historical Investigations Unit (HIU) would effectively bar current and ex-PSNI or RUC officers due to potential bias it might cause in investigations – but that Gardai could still serve on the unit. The Upper Bann MLA said the idea had been raised with him by high-level sources in both the PSNI and the Department for Justice (DoJ). But the government has strongly rejected Mr Beattie’s assertions. 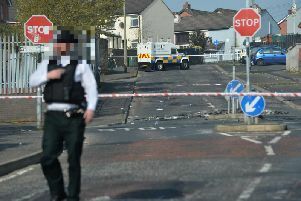 In a statement issued to the News Letter on Thursday by the Northern Ireland Office, a government spokesperson said: “The suggestion ex-PSNI and RUC officers could be barred from working in the Historical Investigations Unit is wrong. “The upcoming public consultation on legacy issues will include clear proposals that the HIU will be required to recruit people with experience of policing in Northern Ireland. “The HIU will be under legal obligations to operate in ways that are balanced, proportionate, transparent, fair and equitable, which will help provide better outcomes for victims and survivors. “It will be important that the HIU can investigate deaths without conflict of interest. To allow for this, the HIU will also recruit some people who have experience of investigating crimes outside Northern Ireland. In the majority of cases, however, conflict of interest will not be an issue. “The UK Government expects that ex-PSNI and RUC officers will make up a significant part of the HIU workforce. Mr Beattie said it was now incumbent on the government to clear up the matter once and for all. He added: “I urge the NIO to speak to the DoJ – who will have overall responsibility for recruitment to the HIU - to ensure they are singing off the same hymn sheet. Mr Beattie declared on Wednesday that excluding serving or former police offers from the HIU would amount to an “insult” to officers who have dedicated themselves to policing the Province. The former solider added that it would “not make sense” to exclude police officers from Northern Ireland, but to still allow Gardai to join, given the past allegations of collusion between members of the Republic’s force and the IRA. Victims’ campaigner Kenny Donaldson also said that it would contradict assurances given to him by the secretary of state.